Lightweight protector meant to cover just the chest and allow maximum freedom of movement. Please review the dimensions before purchasing to make sure this is the right chest guard for you. Molded, contoured chest guard with hidden trauma plate protection during sparring. Hidden trauma shield to disperse impact for better protection. Lightweight, comfortable to wear and does not restrict movement. Just 1 1/2" thick for better mobility, weighs just 1 1/2 lbs. Available in Blue and Red. 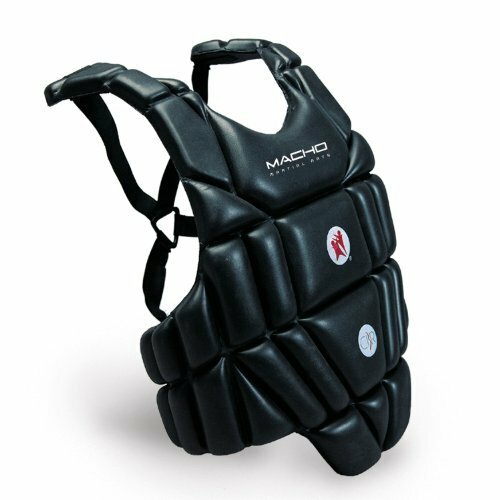 Youth chest protector sizes available. 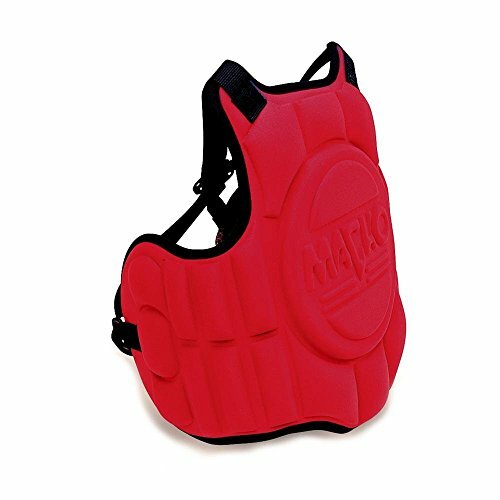 This chest protector is designed by Christine Bannon-Rodrigues, 9-time Martial Arts World Champion. 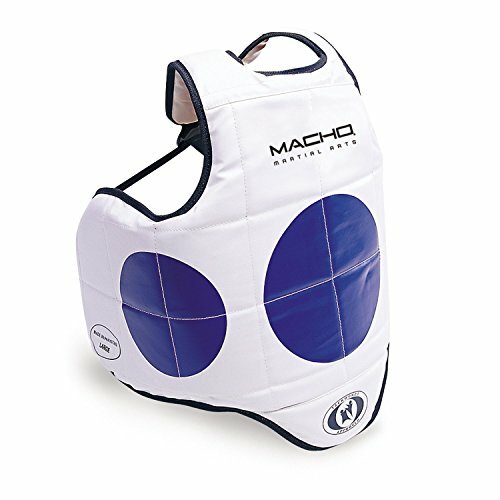 Durable high density chest protector with Taekwondo scoring zones. Contoured shape designed to conform to all body types for a comfortable fit that doesn't interfere with sparring. Red scoring zones on one side, blue on the other. Meets or exceeds necessary tournament requirements for safety. Durable, high-density EVA foam with a soft vinyl cover. 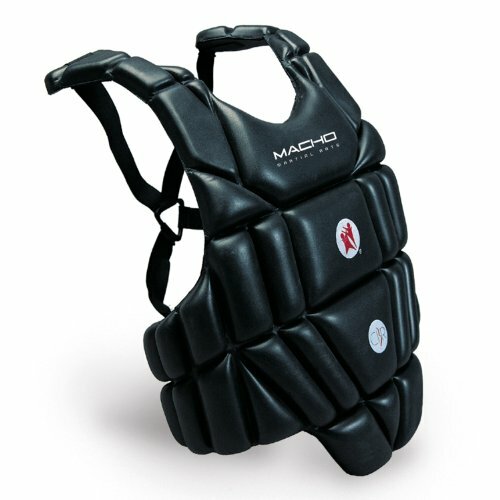 Reversible, contoured special shape designed by Macho to conforms to all body types. 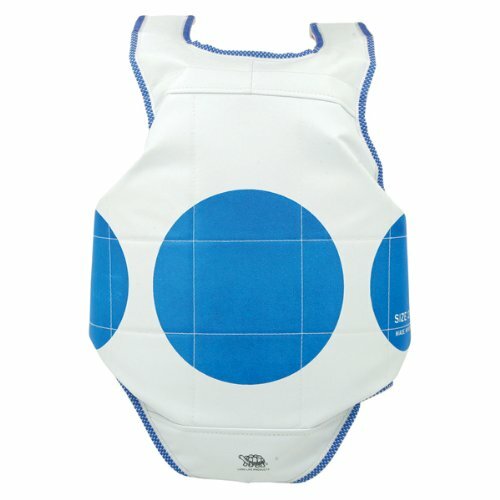 This chest protector has red and blue scoring zones and is reversible. Easy on, easy off styling with one adjustable and one tie strap. Lightweight and durable for repeated use. 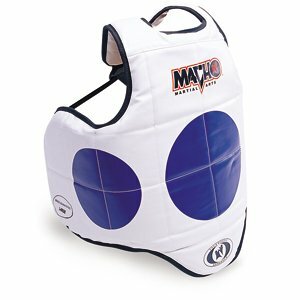 Molded lightweight chest guard by 9-time Martial Arts World Champion Christine Bannon-Rodrigues. Coverage of critical areas while maintaining maneuverability. High, above-the-hip cut to reduce shifting when sparring. 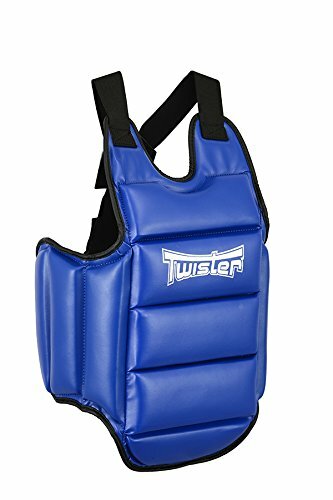 Ideal for sport karate tournament circuits that require chest protection for competitors 17 and under. 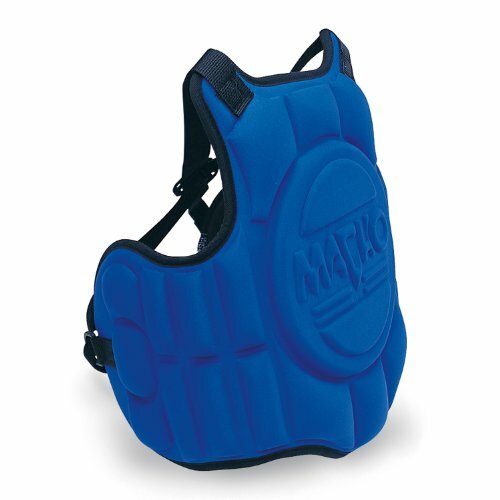 Ultra lightweight with excellent mobility, this chest protector provides protection and shock-resistance with high-density 1" thermoformed polyethylene. Above-the-hip design reduces chest guard displacement when holding chamber position. Open back with elastic crisscross strapping. Easy on/Easy off over the head wear. Adjustable snap buckle at waist ensures a secure and comfortable fit. The Macho Competition Hogu features a modified, contoured shape that enables freedom of movement without compromising safety. 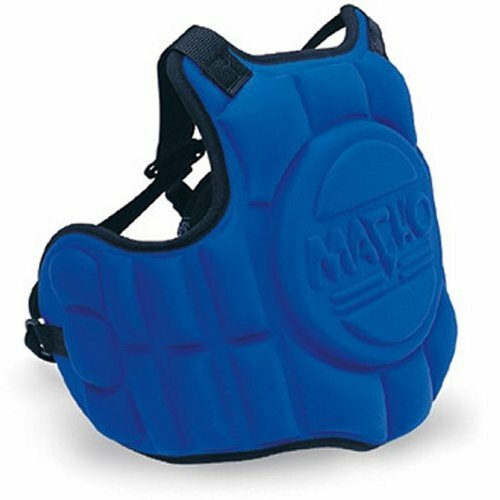 The macho warrior sparring gear is made from a highly dense foam specially formulated foam that absorbs and disperse impact. 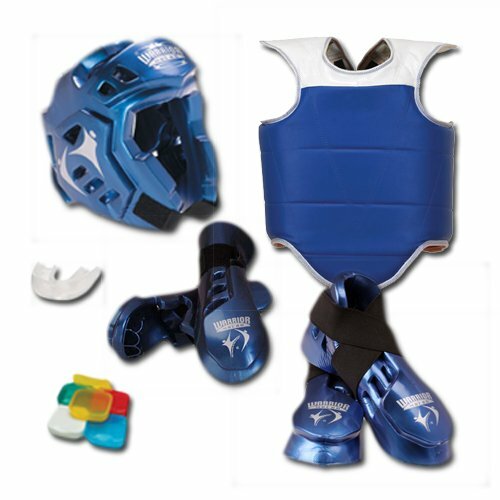 The Warrior sparring gear offers a double layer of protection on all critical striking areas like the top of the head, around the ears, knuckles, top of foot and instep. This means twice the thick and twice the protection of the Macho Dyna sparring gear. 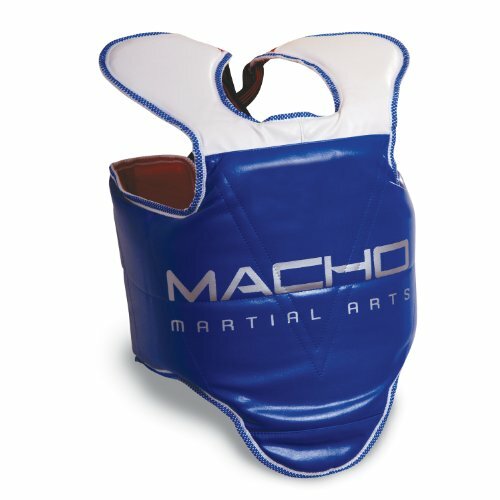 If you believe there is never enough protection, that the Macho Warrior sparring gear is for you.